..:The Truth is Too Complex And Frightening:..
Amazon Price: $14.95 $7.47 You save: $7.48 (50%). (as of February 3, 2019 3:28 am – Details). Product prices and availability are accurate as of the date/time indicated and are subject to change. Any price and availability information displayed on the Amazon site at the time of purchase will apply to the purchase of this product. If a person could travel eternally through space and time, how would this power affect him, psychologically and emotionally? In a fun and accessible way, Doctor Who Psychology explores this question through an analysis of the longest-running sci-fi TV series of all time. 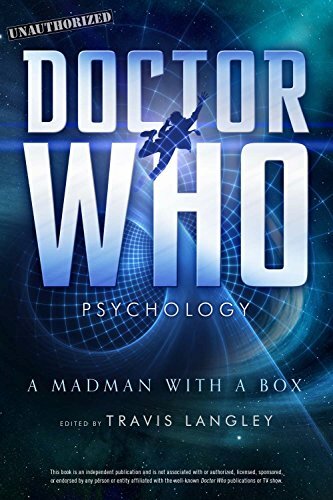 This fascinating in-depth academic study, edited by Travis Langley, contains 20 chapters delving into the psychology behind the time-traveling Doctor in his many iterations, as well as his companions and his foes. "Getting to the Hearts of Time Lord Personality Change""Who's Who: Interview with Four Doctors and a River on the Core of Personality""Post-Time War Stress Disorder""A Companion's Choice: Do Opposites Attract? ""From Human to Machine: At What Point Do You Lose Your Soul?"